El Monte Sagrado, meaning “the holy mountain”, is a luxurious hotel and spa in Taos, New Mexico, located in the astonishing landscape of a high desert nestled at the foot of the Sangre de Cristo Mountains. The award-winning hotel is renowned for its stunning suites, excellent spa, and the creativity of its menu offerings. El Monte Sagrado caters to couples, families, pets, and has superb rooms and services for weddings and meetings. 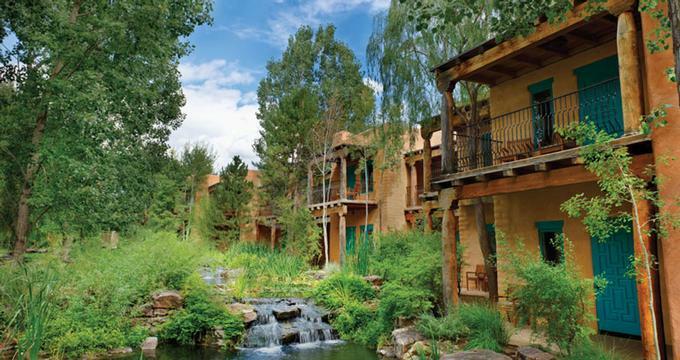 El Monte Sagrado is located in Taos, within easy walking distance of shopping, galleries, museums, and dining. The hotel has lush gardens, and willow and cottonwood trees dot the property. Even indoors there is a sense of nature, centered around a waterfall and its surrounding aspen trees. El Monte Sagrado offers eighty-four rooms, including seven three-room suites that showcase art and décor from global destinations. These Global Suites all offer two spacious bedrooms, a living room, and two full bathrooms, a private outdoor courtyard, a gas fireplace, a wet bar, and flat screen TVs. If you would like to be able to relax in a private outdoor hot tub, choose the Argentina, Mexico, Morocco, or Marrakech suite. The Argentina Suite’s décor brings to life a rural South American farmhouse, rich in leather, copper, and earth tones. The minimalist Japan Suite contains shoji screens and Japanese watercolor paintings. The Marrakech Suite has furniture made of hand-carved teak, gilded floral stenciling in traditional motifs, and velvet and satin furniture. The Mexico Suite is vibrant and dramatic, with ornately carved beds. The Morocco Suite is full of bright colors and lively designs, and is decorated with custom-made stencils. The Spain Suite is resplendent, with embroidered fabrics, handmade rugs, and sparkling iridescent tiles. The Western Heritage Suite echoes Texas farmhouses, with tooled and fringed leather seating, and hand-hewn stone furnishings. There are four Premiere Suites available, all of which have a bedroom with a king-sized bed, a dining and seating area, a mini-fridge, a gas fireplace, a large private patio with mountain views, a gas fireplace, and internationally-inspired décor. There is an Egyptian suite, a Bali suite, a Tibetan suite, and a Romance suite. 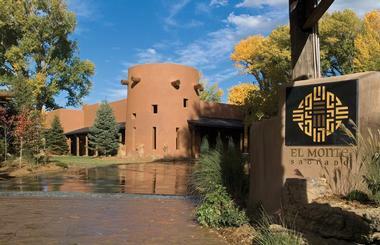 El Monte Sagrado has eighteen Native American suites in honor of the tribes of Mexico and New Mexico. Each has a spacious bedroom with a king bed, a living room with a queen sofa bed, a semi-private courtyard or balcony, a mini-fridge, and a traditional kiva (“beehive”)-shaped fireplace. The Taos Mountain rooms have two queen or one king bed, a desk, a shower a jetted soaking tub, and private balconies with garden views. 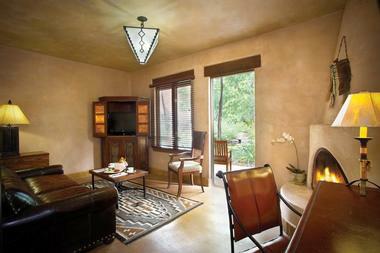 The Casita Suites are the original rooms of the hotel. They have a global feel to them, and are furnished by local artists. The rooms have the traditional heavy-beamed ceilings of the Spanish southwest. Each has either a double, queen, or king bed, a breakfast sitting area, a private, spacious courtyard patio, and a gas fireplace. The De La Tierra restaurant combines local seasonal flavors alongside world cuisine to create a highly original and delicious menu. Guests are welcome to dine either in the restaurant or al fresco in the gardens. The Anaconda Bar is topped with a huge anaconda sculpture, and is decorated with large saltwater aquariums. 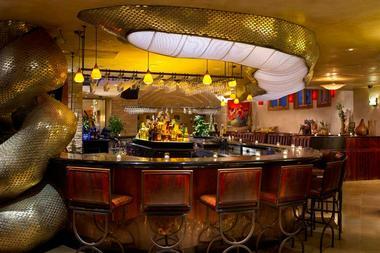 Guests can enjoy the bar’s creative cuisine or its signature margaritas. A secluded wine room is available for private dining. It seats up to eight people in a Mediterranean-inspired room; custom menus and wine pairings are offered by the chef and his staff. El Monte Sagrado’s world-class spa is called The Living Spa, which has a wide range of standard offerings as well as more unique fare. Massages of many types await guests of the spa. The Living Spa offers Swedish massage, deep tissue rubs, hot stone massages, pre-natal massages, rubs for tired hands and feet, scalp massage, and a floral harmony massage designed to release tension and increase mental harmony. For your skin, you may choose from a wide menu of body and face treatments, or select both in one of The Living Spa’s package deals. Exfoliation, body polish, seaweed wraps, mud or clay wraps, and many types of facials await. The different facial treatments available help in a variety of ways: to assuage wrinkles, to reduce puffiness under the eyes, to moisturize dry skin, and to attend to the special needs of men’s skin affected by daily shaves. Manicures and pedicures are offered at The Living Spa. 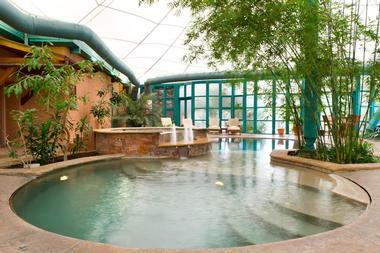 Other spa offerings include soothing herbal baths, waxing, astrology, and tarot card readings. 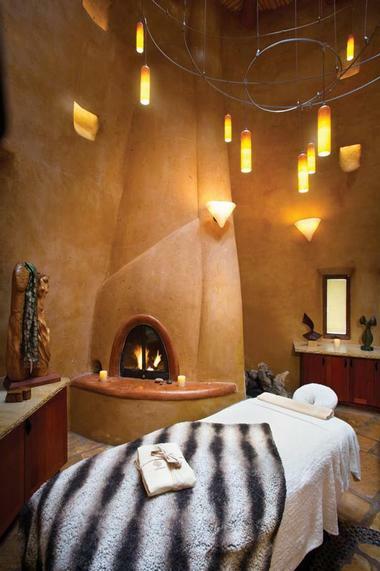 Some of the specialty spa packages at The Living Spa include the Sacred Staurolite, which is a regenerative and balancing spa treatment that uses the staurolite rock crystals indigenous to the Taos region. This curative treatment begins with a dry brush to exfoliate the skin of the entire body, followed by a mud body wrap. The face is soothed and moisturized with an aloe mask. Reflexology is used to help relieve stress and tension. The Sagrado High Desert Treatment begins with gentle massage using oils of local wild plants and flowers, and follows up with a clay body wrap. The Moisture Drench treatment is for dry or aging skin, and begins with exfoliation. A turquoise mud wrap ensues, as does a hydrating, all-over body cream with the soothing scents of lavender, citrus, and sage. Guests can also try the Hot Towel Infusion, which combines hot towels and hot packs, loaded with essential oils, to relax and detoxify the system. El Monte Sagrado is a premier facility for conference or wedding needs, and its beautiful gardens, exquisite grand ballroom, and multiple meeting rooms make it a popular destination for many. Up to two hundred people can be seated in the ballroom, and the business center of the hotel offers everything a meeting needs, including free printing, a state-of-the-art audio-visual array, and catering options. Weddings can be held outdoors in the gardens, or indoors near the waterfall and aspen trees. The hotel’s expert wedding coordinators can help guests arrange flowers, photography, and music; excellent menus are available, and can be customized by the catering staff. Taos is a popular outdoor destination for both winter and summer. Skiing in the Sangre de Cristo Mountains is great for experienced skiers and for novices and children alike. El Monte Sagrado can help you rent equipment, get lift tickets, or tell you about the other outdoor winter pursuits that Taos has to offer. Guests who don’t ski can enjoy snowshoeing, cross-country skiing, snow-boarding, tubing and tobogganing, and can zoom around the terrain on a snowmobile. Summer visitors can hike in the mountains, enjoy the view from a ski lift, go mountain biking, horseback riding, and even go trekking with llamas. For the truly adventurous, white water rafting, rock climbing, and balloon rides are on offer in the Taos region. Museums, art galleries, and historical sites abound in the Taos region. Taos was once an important trade center at the north of the Spanish Empire, and the trading post – La Hacienda de los Martinez – stands today and is open to visitors. Later in the city’s history, E.L. Blumenschein established Taos as an artist’s colony, and his home still stands and is open to visitors. The Harwood Museum of Art and the Kit Carson Home and Museum are also sought-out visitor destinations. Taos still attracts artists, and the many galleries in the city boast beautiful pieces in many media. For guests who love to shop, Taos is a great destination. One-of-a-kind art, antiques, Native American artifacts, and turquoise and silver are among the wealth of items to be found in Taos shops. Find more great Southwest USA vacation ideas.